The Best bet for getting around Bay Bridge closures is BART. Please make plans to arrive earlier or later than the peak commute hours to avoid the heaviest traffic. Also, please take the bus to the BART station, or have someone drop you off, as parking in BART lots is limited. Motorists are advised to avoid the area, and if driving, should expect severe delays and plan accordingly for their commutes. 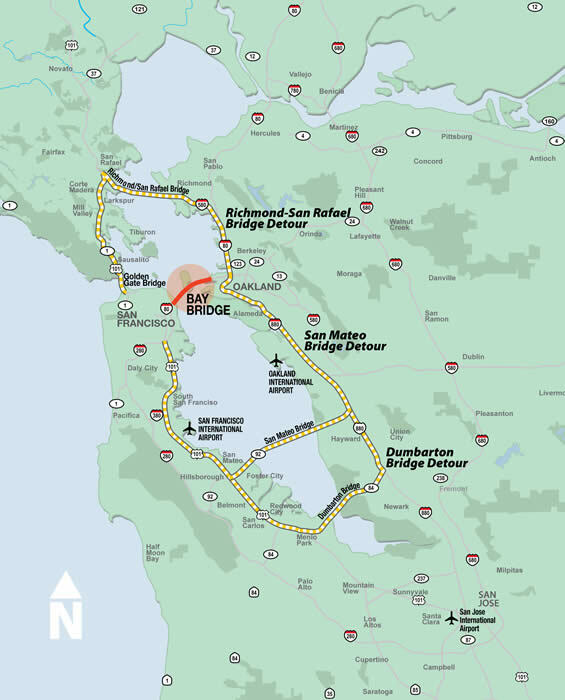 Click here for Bay Area Traffic Road Maps, Accident Reports, and Traffic Flow. 511.org Your Bay Area Travel Guide brought to you by the Metropolitan Transportation Commission. BART recommends riding the bus to the BART station, or being dropped off, as parking in BART lots is limited and BART is anticipates higher ridership than usual during bridge closures. Some lots typically have extra capacity; these are Millbrae, North Concord, Coliseum, and Hayward. Fewer cars traveling through the area will result in less congestion. Need someone to carpool with? Find an instant match by using the 511 RideMatch Service. Click here to start. Meet your carpool partner at a park-n-ride lot. Try casual carpooling. There are numerous additional casual carpool locations in the north-western East Bay that may also work for you and your carpool partner. Click here for a link to the Bay Area casual carpool website. Ask your employer if you can telecommute on a temporary basis. You can either work from home during rush hour and then go into work, or work from home all day. Consider holding meetings via conference call, too.